Mike Murtaugh is a health and wellness teacher at The Primacy Collegiate Academy in Taipei, Taiwan. Drawing upon the Nourish: Food + Community film, Nourish Curriculum, and field trips to a local farm and markets, his students explored the story of their food. This summer, I taught a two-week food literacy course that focused on local food, healthy eating, and fitness. On the first day of class we reflected on such questions as “Where does our food come from?” and “What is health?” This set the stage for our study of different world diets, including our own. The afternoon of our first day, we visited a CSA farm. The students directly experienced how food is grown, and more importantly, connected with a local source of food in our community. The second day, we viewed and discussed the Nourish: Food + Community film. During the screening, we paused the video periodically to engage in small group conversations. One of the “light bulb” moments related to how much corn is present in our modern diets, particularly with fast food. During the first week, we inquired into global and local food connections. Students completed Activity One: The Story of Food from the Nourish Curriculum. As part of our research, we visited an international grocer and selected a variety of foods for closer examination. Part of the assignment was to identify five foods that were from outside Taiwan and to estimate the distance these items traveled. 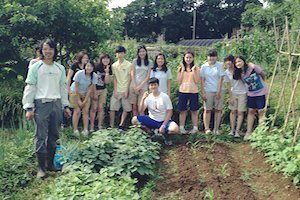 Students also found five local foods and identified where they came from within Taiwan. In the classroom, this knowledge transitioned nicely into a discussion about processed foods versus whole foods. Students conducted research on the ingredients found in processed foods, and made the link to health effects on their bodies. We also discussed the tradeoffs of transporting food around the world. One of the ongoing assignments was to photograph everything we ate during the two-week class and email the images to a shared Evernote site. For the duration of the course, we prepared fresh food and juice together as a class. Each morning we discussed the sources of our food and how a certain food would make us feel. The students soon realized that their food choices have a major affect on their overall health. Often, we took a trip to one of the many morning markets in Taipei. On most days, in the early hours, local small-scale farmers set up in stalls designated for night markets. 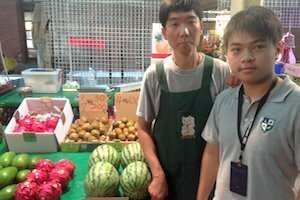 For me personally, access to fresh fruits and vegetables is one of the best things about life in Taiwan. The morning markets offered a perfect setting to inform Nourish Activity Two: Seasonal, Local Food. While at the market, students made a list of every local food they could find. Back in the classroom, students constructed their “seasonal food wheels.” Here in Taiwan, we’re fortunate to have an abundance of local food. One of the only imported fruits we found were apples from Chile. Throughout the course, students experienced the many ways they connect—individually and as a society—to the story of food.